CALL TO BOOK £15 CHILD TICKETS. 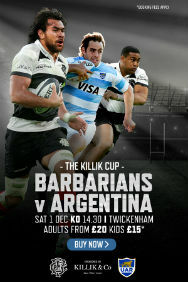 The Barbarians will be back in action against Argentina at Twickenham on 1 December for the annual Killik Cup match, bringing together two of the most exciting teams in world rugby. The famous invitation side were in action against England at Twickenham last weekend. Now they are set to take on the Pumas after their last meeting in a spectacular 125th Barbarians anniversary match in 2015 which saw 12 tries scored as Argentina won 49-31. The Baa-baas fielded the likes of Fiji great Nemani Nadolo, Australia’s Tevita Kuridrani, New Zealand’s Ryan Crotty and South Africa’s Pat Lambie in that game. And the 2018 instalment will see the Barbarians once again bring together another superstar side including legends from New Zealand, South Africa and Australia.